Crosswalk at Court Pl. and Littleton Blvd. Can something be done about the crosswalk at Court Place and Littleton Boulevard? 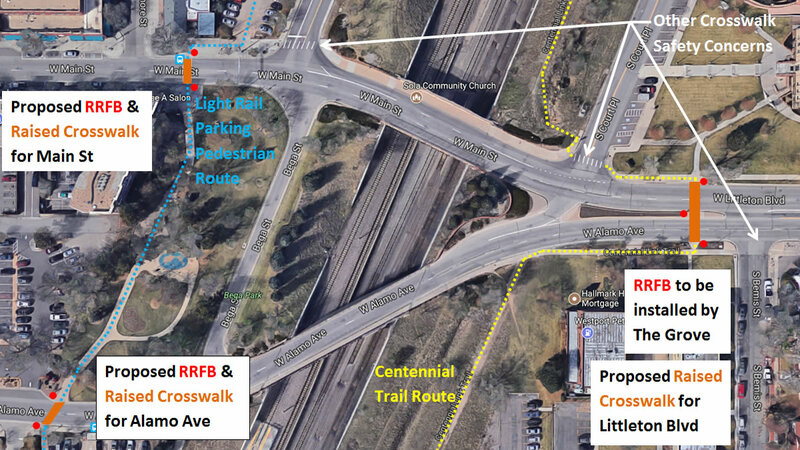 The crosswalk essentially sends walkers and riders out into Littleton Boulevard. The crosswalk needs to move north, to a speed bump crossing in front of the Court House (E) & Trail (W). Improvements at this location are already planned for October. As part of The Grove development, the developer is paying for and installing a new pedestrian activated signal (RRFB) that will greatly enhance visibility to motorists in the corridor. This installation is part of a larger plan to enhance crossings in the area when funding becomes available, an image of the proposed improvements is below.